Relive those magic days for us. I’ll put my memories up after a few folks log in. Christmas 1970. I was nine. Got a Lifelike (I think) trainset with a Docksider and four cars, plus a Rivarossi 0-6-0 switcher. I set up and ran that little circle of track until ozone filled the air. Those of a certain age may recall the distinct smell of running trains decades ago. They were pulled by a refurbished steamer with a missing front truck, on a loop of track fastened to a sheet of homasote. Buildings were an assortment of cereal and oatmeal boxes, and I loved it. Jonathon, for those who had a Lionel steam engine with smoke..... who can ever forget that unmistakable electric train smell of hot electrical stuff and the smoke mixed in. I’ll tell my story after work today . Let’s hear some more. 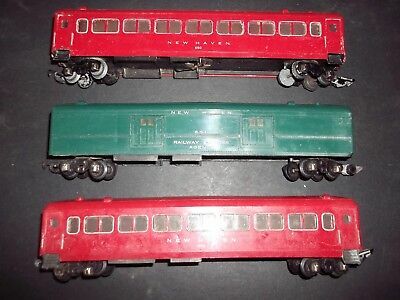 My first electric train was a Marx set, circa 1951/2. It had two F-units painted for Southern Pacific. One unit was a dummy. There were 3 freight cars and a caboose. I probably got it when I was about five or six. My dad later got a tinplate station that had a horn inside to blow. A number of years later I got an American Flyer S gauge set for a birthday present. It came with a New Haven 4-6-2, a baggage car, coach and observation, and a figure 8 of track. Kept that around until I made the step up to HO scale, and traded the AF set for a train board with track already down. First HO loco was an Athearn Hi-F Pennsy F-7. My first XMAS train set, my Dad made, it was a SW switcher 6 Sardine tins and a Caboose. Moved a lot of dirt during the summer!. Made of scrap plywood and 2x4 lumber. Wish I still had it. First Electric train was a TRI-ANG Suburban set from England which I still have on a shelf. I'm not as old as most of you, so my first 'electric' train for Christmas was a New Bright battery-powered G-scale set. I eventually had 4 such trains and would combine all the track into large layouts. Sadly the motors all died and I don't have them anymore. At Christmas 1952 I’d just turned 4. I remember it like yesterday. To receive what I did, I had to hove been liking trains for a while. Both the T&NO and the MP were still in steam and we saw those engines every day. I remember Christmas morning, my much older brother took me to the bowling alley where I loved to go. Of course it was to get me out of the house. When we came back there was a full blown 4x8 Lionel 0-27 layout with full scenery in the bedroom. My father, a friend of his, and my uncle had worked who knows how many nights to build it. It had a passing track and two spurs and a host of “operating accessories “ that would load and unload cars. The train was two Erie FA-1 units and if I remember right, a gon, tank car, stock car , and caboose. I wore that thing out for at least two years and the next Christmas got a Lionel steam freight set to run on it. I wish that as an adult I could have as much fun. Hate to say it , I am a late starter when it came to electric trains . I was telling a friend that I had a deprived Childhood in that I never had an electric train as a youth . My sister heard this and decided she finally had some kind of thing she could get me for a gift . I have all kinds of hobbies but these require considerable knowledge of the requirements of the hobby . My first Trains was a Bachmann Harry Potter train set . I now have a good many trains & related equipment , but still have not got around to building a layout . Hopefully that time will come about . John 2. I was raised with them. Here's a pic where you can see part of my Dad's layout and my first exposure to trains. It was taken 12/24/1949. I was 14 days old. Every year for a while I would get wind up trains for Christmas that were in a circle around the tree. Some time in the early 50's my dad built a Lionel O27 or O layout (I'm not sure which) on an old door and added boards on the side for a little extra width. I hope you don't mind the competitor pics Bachmann. I remember the covered hopper in the pic below he hand built out of balsa wood. You'll also notice the embedded Christmas tree stand in the mountain. Unfortunately, when we moved from St. Louis to Kansas City in '58, he had to sell it before we moved. In Christmas of '58, I got my very own Lionel train set (which I still have). It was a 2-4-2 with three cars and caboose. I have run that under the tree in recent years. As I got into my teens, I left the trains behind. It wasn't until the 90's, when I got grandkids that I got the bug again. Really cool old pics Terry. I was 19 months old, and got a Lionel Prairie type engine with a box car, gondola and caboose. My parents had to feed me at the platform, because I wasnot leaving it for lunch or dinner. With very little fine muscle control at that age, I had a very hard time actually running the train myself with one of those old Lionel power packs with the relatively small single speed control knob. My grandfather would set the train on the track, and I would try to start it slowly. But, mostly I got it going too fast and it left the track at the first curve. For my grandfather, it was repeat - repeat -repeat, for I don't know how long, before I could actually run the train by myself. The next year, he got me one of those power packs with the two large levers for controlling speed (on two tracks, because he also got me another loop of track and an A-A set of F7s with 3 passenger cars). With another year of growth and the new throttles, I had no trouble running those two trains. But, that first Christmas train made an indelible memory. Many years later, after growing to near-adult size, I found the old power pack in a closet. I recognized it immediately, but marvelled at the small size of the speed control knob. By then, I could easily twist it with the fingers of one hand. But, that first Christmas, it took both of my tiny hands, and I still remember how much larger and hard to twist that knob was in my memory. Even today, I can close my eyes, smell the smoke, and see that train running in my grandparents living room, ... and feel that knob. Never acquired my "first childhood (Christmas) electric train", till I was 44yrs young !! In the late 1960s, my dad built a 4x6 n scale layout that we put up every Christmas in the living room. He got me my own locomotive to run on this layout, an Erie FA2 made by Rapido. It had a cast metal body. ran at warp speed, and would pull whatever you put behind it even on the mountain grades of this layout. It was indestrucatable, perfect for a 6 year old's first locomotive. To this day, I am partial to Erie's black and yellow paint. My first was Christmas, 1960 (I was 11), from my older sister. She was just out of High School and working in the big city of Des Moines. Still have it despite my younger brother and sister's best efforts to destroy or sell everything. Anyone remember using cereal boxes, oatmeal boxes, and Log Cabin syrup tins as buildings. Imagination was a necessary thing back then.